I have no way of quickly validating this story but if it's accurate then the Swedish Government needs to re-consider the way they are dealing with any conflict issues between wolves and reindeer. Please go to the petition site to register your support for protection of this wolf. saved at any and every cost. A most certain decision to kill her will be announced on Tuesday February 19, 2013. (Update Feb 19: A court order has ruled that she may not be touched until a final ruling is achieved and that ruling will come end of this week. Read more at the bottom). PLEASE keep signing to put pressure on Sweden to save her. The rest of Sweden's wolves are heavily inbreed and that comes from the state sanctioned hunting and killing off all the important wolves that come into our country. In the Swedish law it's stated that all other measures of protecting live stock has to be taken before a license to kill a predator can be given but that law is toothless and has never been complied with in any case. 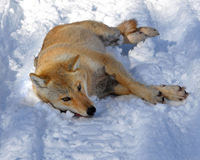 Wolves are being killed constantly without ever having implemented any of the more normal steps of protecting live stock and same goes for this case. The reindeer's are not at all protected. Unfortunately our "Swedish Environmental Protection Agency" has told media that they will not await such a decision, which means they are breaking the law. Appaling how a state owned agency pretending to stand for the protection of nature and wildlife is actually the one destroying it AND breaking the law. This is how great our democracy is. Don't be fooled by our propaganda. This agency is often deciding against nature and wildlife.